Ever heard people visiting Kinari Bazaar on a Sunday when all shops are closed for trade? Well, Skeeter did just that on a not-so-happening Sunday a few moons ago. 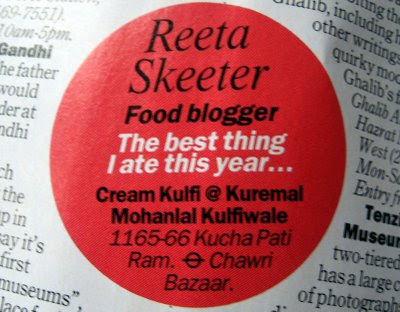 And why is Skeeter telling that to you on Delhi Foodies’ Zone? Walking through Kinari Bazaar, eating golgappe from the street vendor, clicking unusually coloured doors, Skeety stumbled upon the Daulat ki Chaat vendor. She went right past him, and a few moments of brainwork later it struck that this could be the elusive DC vendor! Since Skeety had walked only a few steps ahead, she hurriedly made a U-turn and was relieved to see the DC vendor right there! By asking the vendor it was confirmed that the stuff he was carrying was indeed the famed Daulat ki Chaat! Skeeter’s excitement knew no bounds. Our man Khemchand Adesh Kuamr was quite zapped at the number of questions that were put to him by Skeety. Nonethless, he was sweet enough to answer all of them with a pleasant smile. And before Skeety tells you about the conversation, here is something one should know. 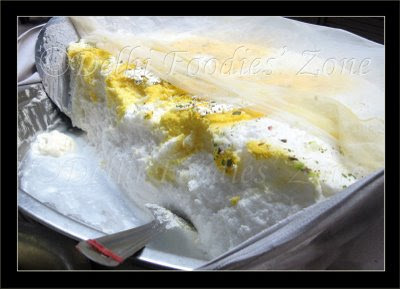 The ‘chaat’ that is being written about here is not the spicy aloo/papdi chat but it is a sweet, froth-like substance. Yes. Brows down please! Skeeter shall explain. DC’s is essentially made from air, dew drops, sugar and milk froth. Due to the legendary notes attached to the recipe of this ‘oh-to-die-for’ delicacy, the preparation begins at night. Milk is kept outisde the homes during winter nights to let the dew drops set in. Early morning the dew-kissed milk is taken inside and whipped till it has a lot of froth over it (The more the dew, the more is the froth. So dew holds the key to this preparation). The froth is now transferred to a big vessel and sprinkled with bhoora or unrefined sugar, khoya and pista slivers. The final touch to the presentation is given by kesar and vark which is a thin edible silver sheet. 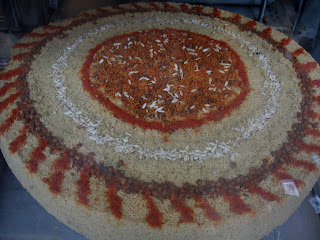 And just before pouring it out to the customer in a leaf-bowl, some khurchan is added to it. Our man puts the DC laden vessel atop a criss-crossed three-legged stool which is refers to as his ‘khomcha’ and sets off early morning to sell it at Kinari Bazaar which is exactly where Skeeter was graced by his otherwise-elusive presence. You could look for him in Kinari Bazaar at Chandni Chowk or you may bump into him elsewhere if you are so destined. You might not always be graced by his presence as he makes and serves DC for weddings as well. Skeety believes there are atleast 5 such vendors in Chandni Chowk area. Another DC vendor called Nandu has been spotted selling the stuff near Kuccha Pati Ram in Bazaar Sitaram. If you have been unlucky enough to not have bumped into any of the DC vendors at Chandni Chowk and are adventurous enough, there are shops in Aminabad area of Lucknow where the Daulat ki Chaat is sold unde the name Malai Makhan. Location: On the large, in Kinar Bazaar and Bazaar Sitaram. Price: Rs.10-15 for a plate of the heavenly stuff. Chandni Chowk beckoned Skeeter yet again. This time it was for childhood love. Skeeter fondly remembers being driven by dad to the ‘kone wali’ shop (Corner shop) for ‘Hot and Sweet’ Jalebis, when she was a child. And when she grew up she was enlightened about the name of the shop. It is aptly named ‘Old and Famous Jalebiwala’. Having a tradition of making and serving Jalebis running for over 100 years, what better name could the shop possibly have? Even more fascinating and dramatic is the location of the shop, for it is located right at the beginning of the famous Dariba Kalan or the Silver Street. The location is also known as Dariba Nukkad (Dariba corner). The entire set-up is bound to make one high and nostalgic. Best dessert and best silver-jewellery shops. They also serve samosas but Skeeter has never cared to taste them because Jalebis RULE. Kailash Jain the owner of the shop poses with a smile for Skeeter. 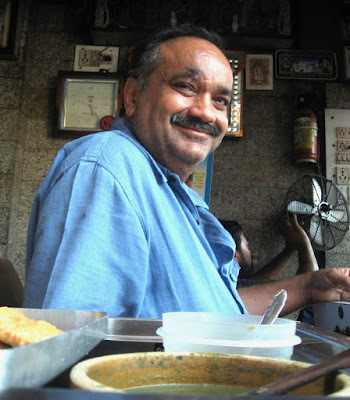 He has been running the shop for the past 30 years and is Skeeter’s ‘Jalebi Uncle’. 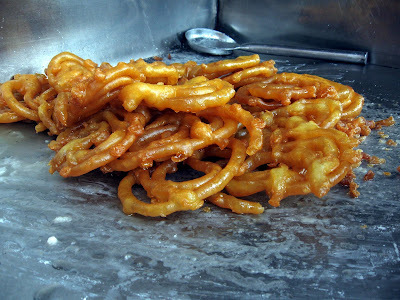 For those readers who aren’t aware of what Jalebis are, here’s Skeeter throwing some light: An Indian dessert, it is made of crisp coils of dough, deep-fried, and thereafter dipped briefly in sugar syrup for the royal taste. Best had hot during winters. Skeeter does not like this explanation, nevertheless it is here for your benefit. 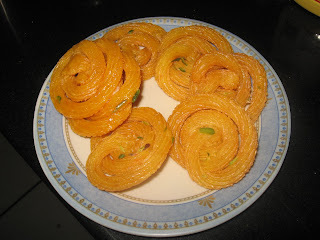 History: The recipe of Jalebis is widely claimed to have originated in the Indian city of Punjab, though they are consumed in Pakistan and Bangladesh as well. Maths: To be had hot PLUS to be had with dipped in boiled milk (for relief from congestion, so day the elderly and the wise), PLUS/MINUS Can be had with/without rabdi. Skeeter’s take: Go to the Old and Famous JalebiWala’s shop. Eat it there when a fresh lot is made. Don’t be greedy else you may burn your tongue. Damages: Rs.100 per half a kilogram. I take one step and stop to look around. To my right (down), is sitting, a paanwala engrossed with filling and wrapping the paan (betel leaf) as per his customer’s order. I look up across the street, there is this famous Indian sweets and savouries shop, Haldiram’s, which is running to a full house. I walk a few more steps. There is this vendor with his small mobile stand, selling moong dal ke gulgule (fritters of an amazing sort) surrounded by customers shouting orders. I take a few steps more and I reach Ghantewala, the much acclaimed sweet shop of Chandni Chowk. Get a few rasmalais from there. White ones. Yes! White! Gol and chapet. That is round and flat ones. I walk down again. Another few steps. Reach Kanwarji‘s. Madhouse this. Mister P loves this shop. He says nothing can beat this place. I keep shut here, as I still haven’t tasted all that Chandni Chowk has to offer. At Kanwarji‘s, I got. Hold Your breath. I got Malpudas, Paneer ki Jalebis, Kachoris with HOT aloo ki subji, Aloo ke lacche (I chose medium spicy ones), and Dal bhuji (maximum spice variety) which might be known to some of you as Dal Moth. I am yet to taste the Malpudas and the Aloo ke Lacche. The rest of everything was good. I am bereft of words more than these. A winner, however, was this list that my eyes rolled upon. It is a list of Mirza Ghalib’s favourite food. And I found that unke aur humare zayke kaafi mel khate hain.